There is no wonder that Nissan counts as a very reliable and dependable brand. However, it is no exception to the fact that vehicles have a limited lifecycle. It is great fun to drive a perfectly working Nissan car, truck and other automobiles. But when it ceases to operate perfectly due to old age or accident damage it is best to get rid of it. 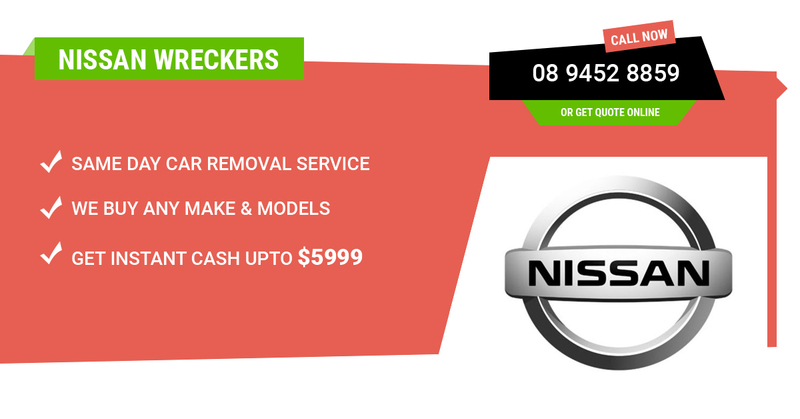 You must choose an authorized and trustable Nissan Wreckers Perth @ Perth Auto Wreckers. We are your best possible option when it comes to scrapping your old Nissan in Perth or anywhere in Western Australia. We pay top dollars for Nissan cars, vans, Utes, SUVs, 4WDs and trucks. The good people of Perth trust us for getting outstanding cash for car and auto removal service. As we are a licensed and committed team with more than twenty years of expertise in this field. Our in-depth experience helps us to correctly deal with every type of old and broken Nissan. Beside this we are also efficient at handling the transfer of paperwork or vehicle licence cancellations, essential for the sale process. Our honest and friendly customer care team excels at giving the best solutions for removal needs. We will buy it for highest dollars. Likewise, we have mastered the art of buying and wrecking different makes including cars, vans, trucks, Utes, 4WDs and SUVs. Our excellent cash for car deals entice most of our customers and they like to keep coming back. Are you planning to ditch your old or junk vehicle? Why throw it in an open landfill when you can sell it to us for cash? We give a lucrative amount of money for old and used vehicles, up to $13,999. However, it can vary depending on how good or bad the condition of your vehicle is. Our company guarantees to pay a genuine cash. You can request for cash quote at any time as it is totally obligation free. We provide an old car wrecking and recycling mechanism that is free from hazards. It is absolutely cutting-edge because we follow environmentally sustainable techniques for vehicle disposal. This makes us skilled enough to deal with any type of damaged automobile. Our professionals aim at recovering the recyclable materials and them disposing the leftover automobile appropriately. Here at Perth Auto Wreckers, we mainly focus on providing great satisfaction to our clients. For this we put all efforts in giving the most convenience experience. We achieve this by offering easy and secure auto towing service from the area specified by the customer. You can simply access our indigenous auto removal facility from any part of Western Australia. We will not charge you any extra dollar for this no matter how terribly wrecked your old vehicle is. We can also help you to fix your used Nissan vehicle on a budget. How? We give complete access to a vast variety of second hand parts and accessories in Perth. Our inventory consists of the well-tested and recycled components that are worth purchasing. As you can get them at fairly inexpensive prices. We have good connections with a large number of auto part dealers in Perth. When we don’t have an ordered part in stock, we ensure to source it from our wide network of suppliers. Whether you need to book a free car removal or get a high quality used spare part. Make sure to connect with our friendly customer support service today. Call us for free @: (08) 9452 8859 or submit the online car valuation form.